The factory schematic for the Acoustic 360 Bass Preamp is widely available on the internet. 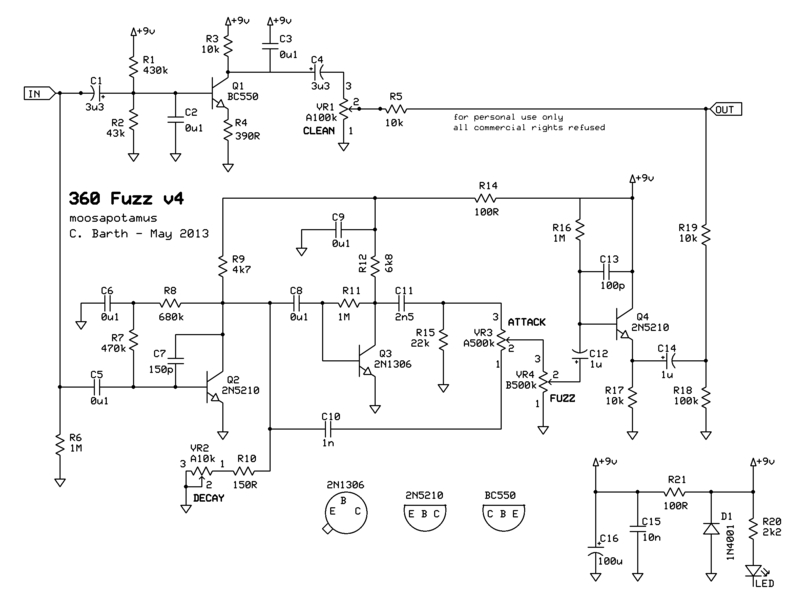 Here is the detail of the original stock fuzz section. And here is my current tweaked, modified and revised version. Compared to the original, I’ve added a clean blend circuit based on the EH Mole/Hog’s Foot, a decay control that let’s you dial in short, gated fuzz sounds, and I either eliminated or adjusted a few component values to make the circuit sound better when powered at 9 volts instead of the 24 volts that was used in the original circuit. Speaking of sound, here’s a short video that illustrates how it works and sounds. 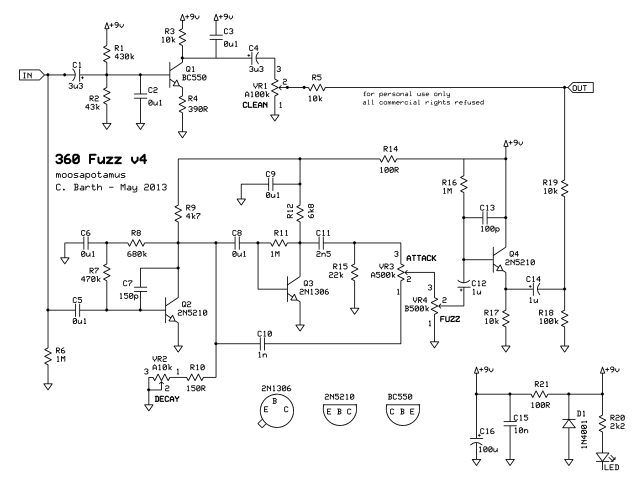 Here’s some construction documentation if you would like to build your own Three-Sixty Bass Fuzz from scratch. You can purchase factory-made PCBs and pedals (hand made by me!) over on my THINGS page. This entry was posted in Fuzz Distortion Overdrive and tagged 360 Bass Fuzz, Acoustic 360, Bass Fuzz, moosapotamus by charlie. Bookmark the permalink. The clean amp is designed to filter highs and provide a way to blend clean low end with the fuzz. It loads down the bass a bit, but it sounds great mixed with the fuzz, especially at high Attack settings. I plug my passive bass right into it, just like I would with any other stompbox. How do i buy a Three-Sixty Bass Fuzz pedal??? Unfortunately, I do not have the free time to build pedals right now (that could change in a year or two, maybe). But you can buy a PCB on the Things Page and find someone with the skills and the time to build one for you. Hi I notice C12 and C14 are shown as polarised electrolytics in the scematic but in the images are not. I take it the board is correct? Yes, you are correct. Polarity is shown in the schematic in case you want to use polarized instead. I have never used any other transistors, but I’m sure you can google suggested replacements. The 2N5210 is silicon (Si) and the 2N1306 is germanium (Ge). Best of luck! Hi! Excuse me for not posting at appropriate page, but Fat’n’pretty page doesn’t have comments, so I must ask you here: what is capacity of C1 – 47p, 470p or 470n? It is labeled as 0.47p, but as far as I know so small capacitors are not available. Prompt, power on the resistor circuit is not specified. Is it enough to use the capacity of 0.25 watt resistors? Particularly interested in the power of resistors R14, R21 of 100 ohms, R10 and R4 150 Ohm 390 Ohm. 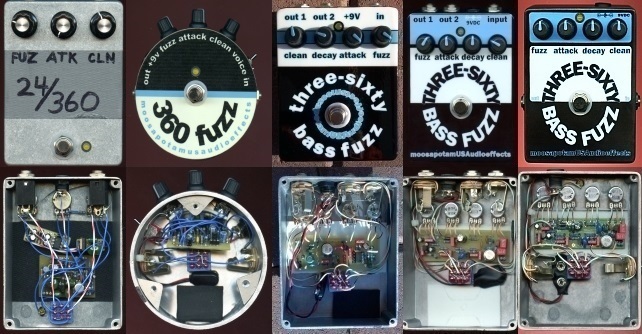 Do you ever make the 360 bass fuzz pedal? Interested. Is there a reason why you changed the polarity of C12 in your schematic compared to the original circuit? Hello and, first of all, thank you for sharing this beauty! 1.1 – C7, C10, C11, C13 and C15 are they ceramic? 1.3 – C11 is proving to be very hard to find at that value where I am. Can it be changed for a slightly different value? If so, is it better to go 2,2nF or 2.7nF? Or a 2.4nF polystyrene? 1.4 – It’s mentioned here in the comments that C12 and C14 are electrolytic, but by looking at the PCB drawing and the open back pedal photo, they seem to be more like polyester or something like that. (again) Is there a big difference? And, if there is, what type are they? 1.5 – C1, C4 and C16 are the ones that look (to me) electrolytic, easier to identify both in the PCB drawing and in the photo. Is this correct? 2 – Components wattage and voltage maximum limits, are there any recommendations? E.g. : Is it possible to use 0,6W resistors and 15V capacitors, or is there any threshold I shouldn’t go below? 3 – Similarly to the capacitors above, I ask what type of resistors were used? Metal film, metal oxide, carbon? And again, is that going to intefere noticeably in the end result? Well sorry for the big block of text, everyone, but I’d really appreciate the help of someone more experienced. Thanks, to Charlie and to everyone else, too. Cheers!